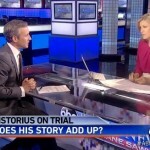 Dan joined host, Diane Sawyer on World News With Diane Sawyer, Friday April 11th, to discuss the latest on the ongoing Oscar Pistorius trial. Pistorius has been on the stand for three days now, being cross examined by a prosecutor known as the “”bull terrier”, for his aggressive and relentless style of questioning. Pistorius has broken down numerous times on the stand, proving to be extremely emotional under this pressure and the prosecution isn’t even done yet. The trial has been going on for three weeks now and Diane asks Dan, “how is he [Pistorius] doing?”. Says Dan, “Based on everything we’ve seen so far he’s got to be worried. I can’t see how the judge isn’t going to at least convict him of the lesser crime of culpable homicide, which is a reckless killing. Also there is a lot of evidence against him with regard to these gun charges and ammunition, so he’s got to be worried…His biggest problem is, he’s saying he didn’t realize that Reeva wasn’t in the bed, even though he had to get the gun from underneath the bed. But when it comes to overt contradictions, the biggest issue for him is, where was he when this all started? In the bail hearing, he said he woke up, went on to the balcony to bring the fan in, heard a noise in the bathroom, and realized someone was in the bathroom, but it would be hard to hear someone in the bathroom if he was out on the balcony. Now, during the trial he’s saying, I concede, I didn’t go in the balcony. This is very important in evaluating, did he really believe there was an intruder there or was there a fight as prosecutors allege?” Watch the full clip here.